Adjacent to place where terror attacks occurred, Arabs erect illegal outpost. Civil Administration conveniently ignores it. East of the Etzion bloc, near the communities of Penei Kedem and Meitzad, residents of the Arab village of Sair are erecting an illegal outpost without any intervention on the part of the Civil Administration. 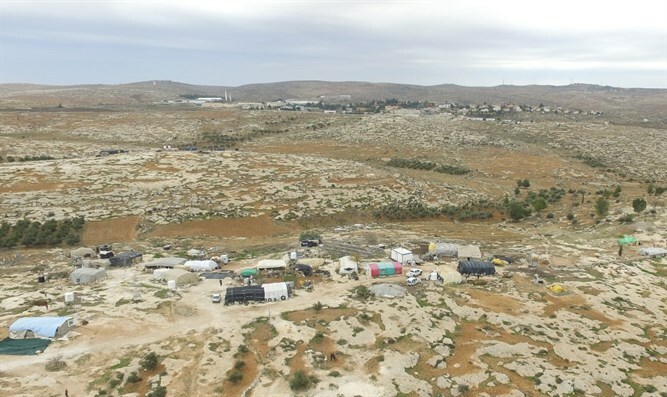 The Regavim organization dedicated to monitoring and pursuing legal action against illegal Arab contruction, has taken pictures demonstrating how after the organization warned the Civil Administration of the outpost, additional buildings were erected. The village of Sair from which terrorists perpetrated a number of shooting attacks against Israelis in the past year is situated adjacent to the area where the buildings are being constructed. Moshe Saville, acting Gush Etzion Council head said that "the enforcement policy of the Civil Administration which is in accordance with their priorities has become absolutely untenable. The Administration places more urgency on destroying Jewish houses built on land which has no known owners and ignores the construction of a new Arab village adjacent to a road in flagrant theft of state lands." He added that "in light of the fact that the construction offenders are continuing to build another illegal building in the area which should be finished soon, the Regavim movement is considering petitioning the High Court against the Civil Administration." Oved Arad, a Regavim local director said that "Besides the fact that these buildings were constructed without any permits and totally illegally, they also represent a major security hazard as they are close to the main road leading to Penei Kedem and Meitzad which is traversed by many Israeli citizens daily."